Deus Ex: The Fall has been released and is available now, on the App Store. Get it here. 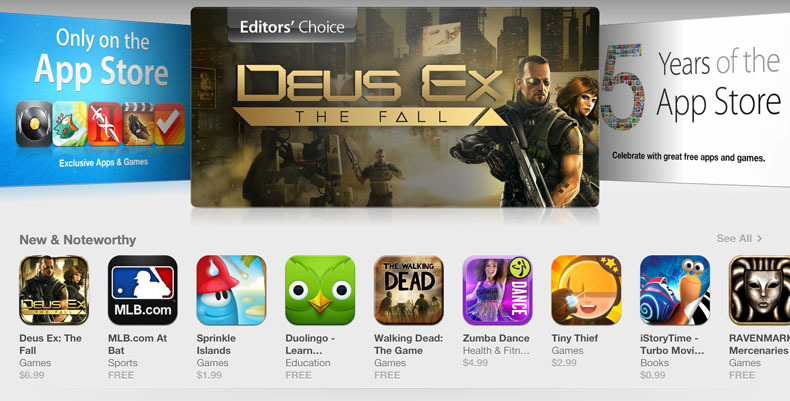 This is especially exciting because Apple has given us the honor of being named Editors' Choice! Lots of people are getting their hands on the game now and we've had some genuinely awesome reactions already. I love reading the comments and watching videos of other players experiencing the game for the first time. It's different from how I experience the game, after working on it for the last year or so. Gamedev is a strange journey... extremely difficult but also very rewarding. Should fans be upset about Deus Ex's mobile debut? Only if they don't own a device capable of playing it. The Fall is a worthy addition to the series that should not be missed. I could probably just go on and on about Deus Ex: The Fall, but the bottom line for me is that despite a few hiccups here and there it's one of the finest first-person shooters ever released for mobile platforms. The mysterious and well-told story, steady stream of powerful new augments, and impressive game world all combined to create a mobile experience I didn’t want to put down after I started. Of course not all of the feedback is positive. The game is being subjected to some serious scrutiny and criticism, and a lot of people have weighed in on it. There's a great deal for me to learn here, even if some of the choices players are upset with were out of my hands. I still have to take responsibility for the game as it appears now, and stand behind it. I want as many people as possible to play the game. Knowing that lots and lots of players are having personal experiences with your game is one of the great joys of being a game developer. It's why we do it.